It can be said that self-care is an art. Living day-to-day with all of our responsibilities toward family, friends, and work can leave us torturing ourselves with feelings of fear, worry, stress, and even anger. So much energy is spent on managing and organizing all of this without a consistent and essential focus on the single most important person…YOU! 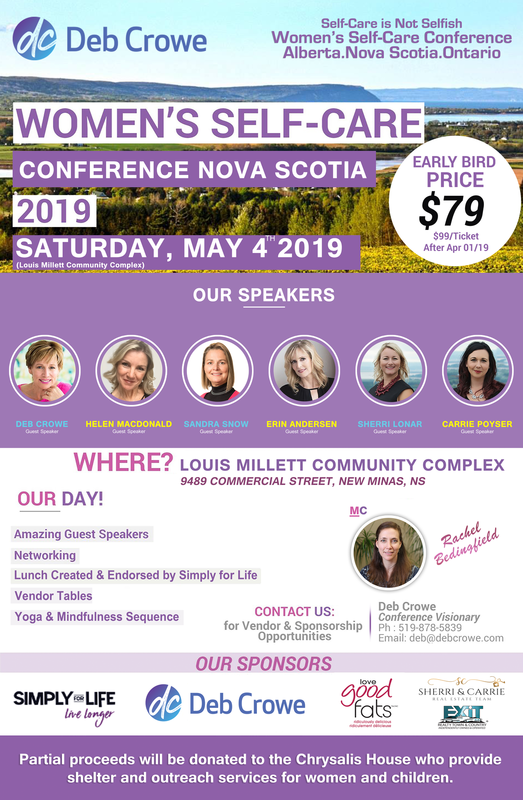 It’s time to change the story, break the cycle, and immerse yourself in a fun and relaxing day of nourishment for your body, mind, and spirit. Join Deb Crowe, Helen MacDonald, Sandra Snow, Erin Andersen, Mayor Sandra Snow, Sherri Lonar & Carrie Poyser for a day of learning, movement, a delicious, nutritious lunch (created and endorsed by Simply for Life), yoga, mindfulness, and some new strategies for work-life integration! We are honored to have Rachel Bedingfield as our MC!